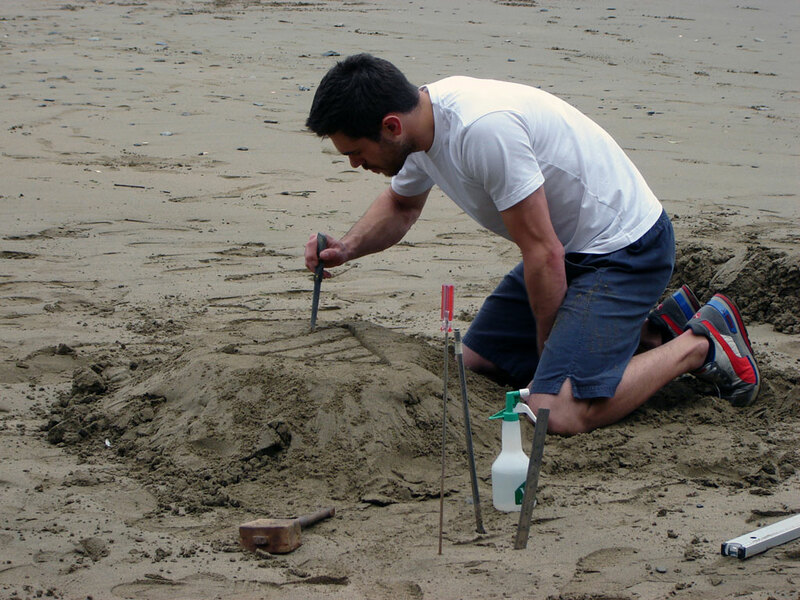 Sand casting is one of the earliest forms of casting due to its simplicity and low-tech materials required. 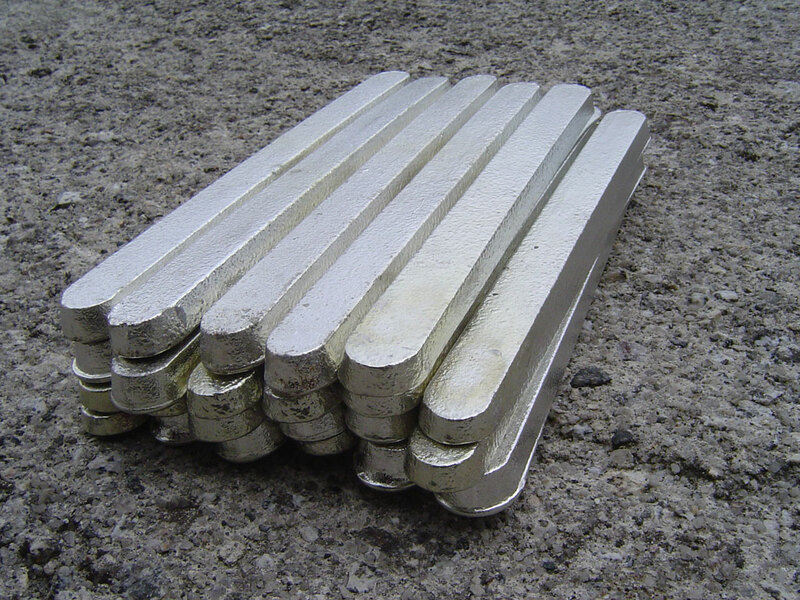 Sand casting produces metal components with a rough sand-like texture, often with a crude degree of accuracy, and therefore requires various finishing techniques to improve the surface finish. Such techniques include grinding, filing, hammer and shot peening, polishing and plating. Molten metal is poured into a cavity mould made in either natural or synthetic sand, usually bonded with oil or chemical binders. Green sand is a mixture of sand, clay and pulverized coal bound with water to produce a green mould that needs drying prior to casting, to prevent the molten metal exploding. 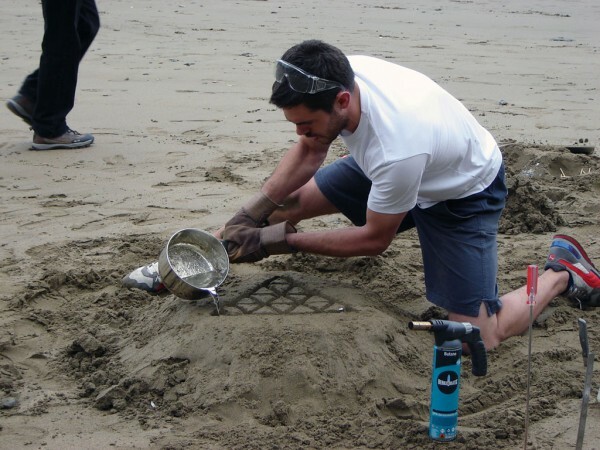 In industry, sand casting is typically just one of many process involved in the production of a single metal part. A master or pattern of the design is made by a patternmaker. The pattern is made slightly oversized due to the shrinkage of the metal that occurs during cooling. This is calculated using a measuring device called a shrink rule, appropriately scaled depending on the metal to be cast. The pattern must have a slight taper known as a draft angle on all vertical surfaces, to enable it to be removed from the mould without disturbing the sand. A conical shaped sprue is added to the pattern to allow the molten metal to be poured into the mould easily and for overfill. A riser is also added to allow for the escape of air when the metal enters the mould. The moulding box is made of two halves called the cope and drag. Sand is compacted into each half, the pattern is placed onto the surface of one of the sand boxes and the two halves are pushed together. The pattern is then removed leaving the negative cavity of the object within the sand ready for casting. Once the sand mould has been made, incorporating pattern, sprue and riser, the molten metal is poured into the cavity via the sprue. Once cooled the solid metal component can be removed. 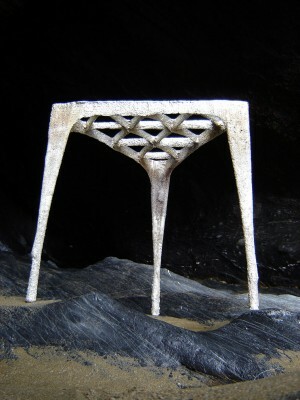 My Pewter stool was made using a very simple form of sand casting. 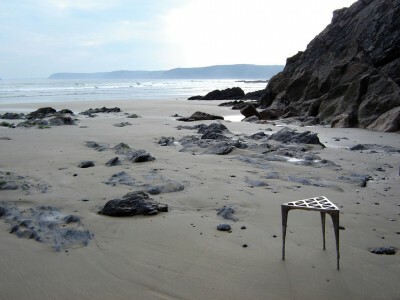 I chose to use the natural landscape of Caerhays beach on the South coast of Cornwall to make the stool. 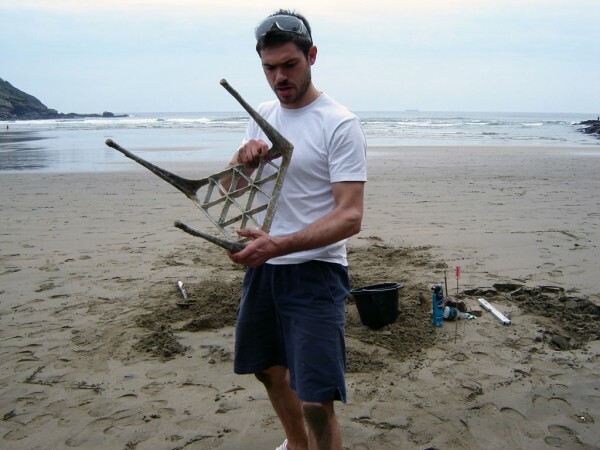 Most of my childhood was spent on this, and other, Cornish beaches building castles, boats and tunnels in the sand, and I decided it would be nice to return to my favourite beach to produce a stool using a process Cornwall was once famous for. During the mining boom, Cornwall had two of the World’s three largest mine engine foundries (Harvey’s 1779-1903 and Copperhouse 1820-1869). 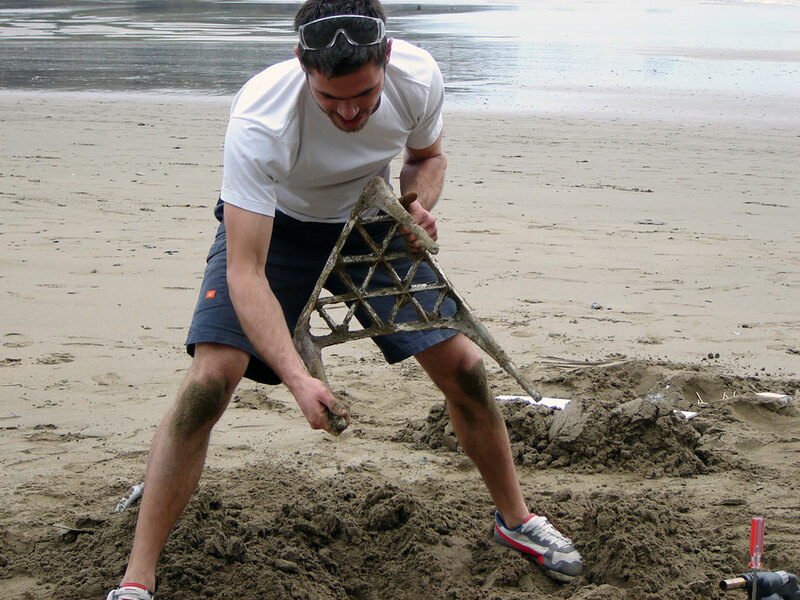 They were both located in Hayle, where the fine quality of the Hayle estuary sand was perfect for sand casting. Caerhays beach does not have the same fine sand as found in Hayle, but some areas of the beach boast sand of a consistent grain free of large stones or shells that would make carving an accurate mould impossible. The far western side of the beach is also completely below the sea during high tide, making the sand very well compacted, and remains nice and damp during low tide. I had a portable twin gas cooker that I dug into a trench in the sand. 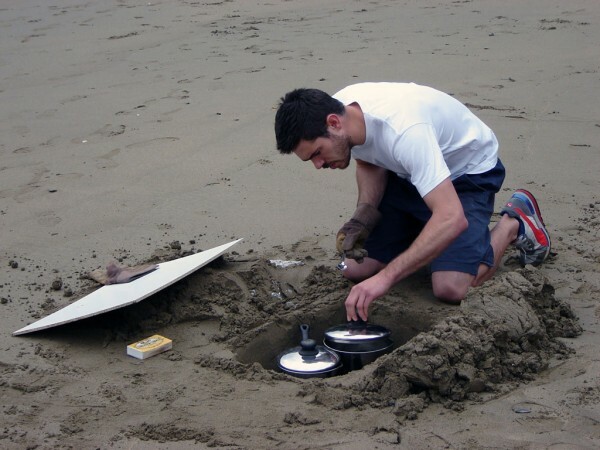 By being below the level of the sand I could cover over the cooker with a wooden board to divert the wind and achieve the highest temperature possible. The 1kg pewter ingots, made by Geoff at Carn Metals in Pendeen, took about 10- 15 minutes to melt at 236ºC in two of my Mum’s old stainless steel saucepans. 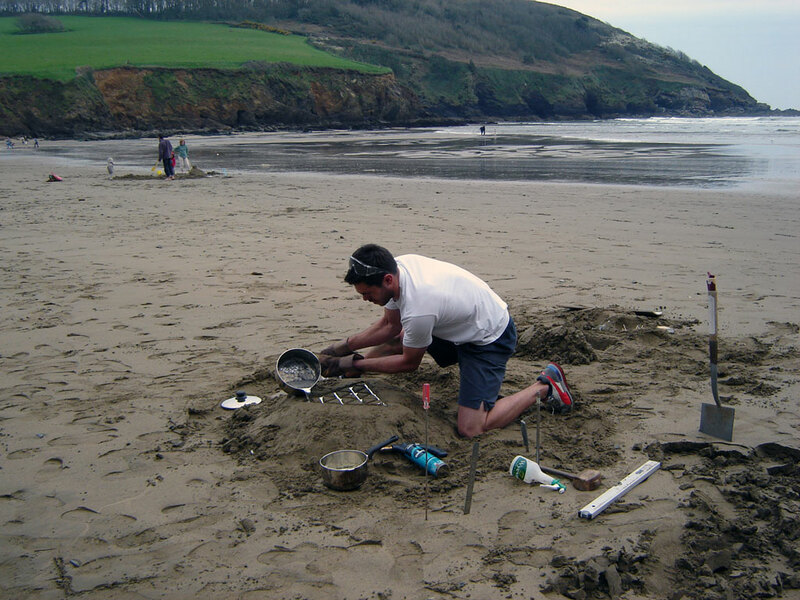 Whilst the pewter was on the heat I sculpted various shapes and forms into the sand using simple tools such as a 10mm Ø metal rod, a small dibber used for planting seeds and a kitchen knife. Once molten I poured the pewter into the moulds to see how easily it flowed into the cavity, and how intricate my patterns could be. I spent the first three days simply discovering what I was capable of carving and what the sand was capable of being carved into. 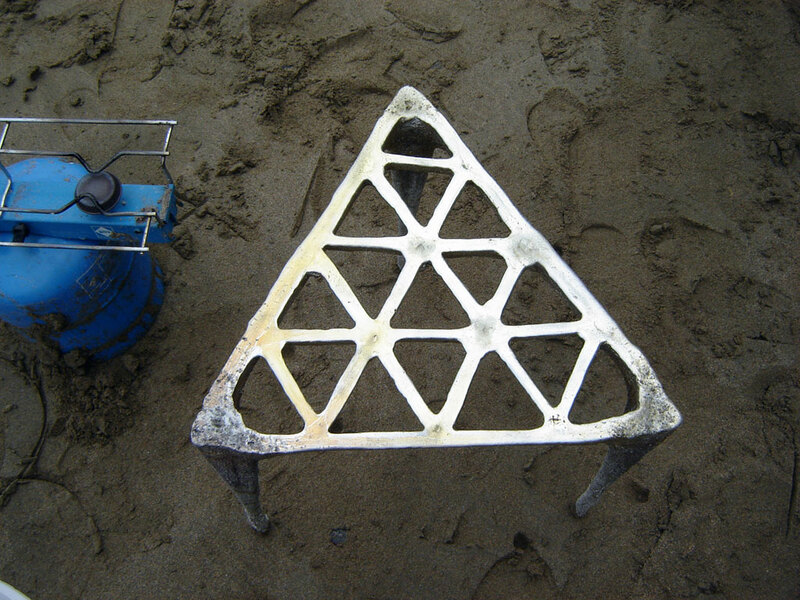 I decided upon a three-legged stool with a triangular seat surface formed of sixteen tessellating triangles. 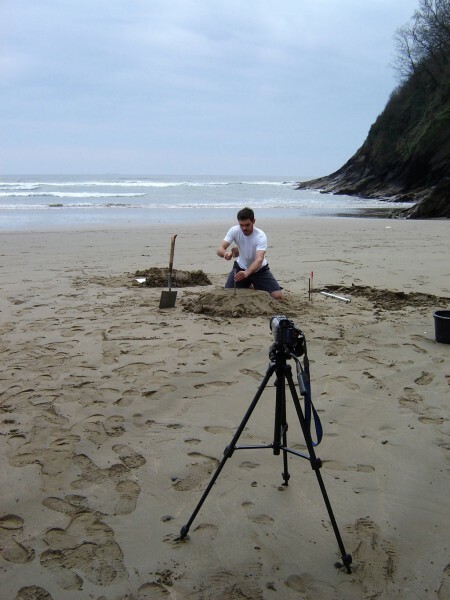 I noticed during my experiments that when I dug a deep hole into the sand, due to the height of the water table dropping slower than the height of the tide, the molten pewter did not always reach the bottom of the hole. This would make four legs of equal length difficult to achieve, and so by making a stool with three legs, even if the legs were not exactly the same length the stool would always sit level on the ground without wobbling, even on an uneven surface. The seat surface is like a triangular mesh that achieves the largest sitting area with most economical use of pewter, saving both weight and money. I began by marking out a 400mm equilateral triangle in the sand, divided each side into four sections and marked a line between each. By drawing a line between each corresponding mark on the opposite side of the triangle, the large triangular surface of the seat was divided into sixteen smaller triangles. I then took the 10mm Ø steel rod that I had prepared with a mark 400mm from the bottom, and pushed it into the sand at one of the three main perimeter corners of the seat until it reached the 400mm depth. I pushed the exposed end of the rod towards one of the opposite corners of the triangle until the sand became compacted and resisted further movement, pulled it back and then pushed it towards the second corner as far as it would easily go. This movement gave the leg a natural taper and a v-shaped cross-section towards the top of the stool, making the leg inherently strong and as light as possible. I repeated the v-shaped hole for the other two corner legs and then began carving v-shaped grooves along each of the tessellating triangles of the seat with a knife. I carefully carved out the sand from each channel to a depth of about 20mm. I had to keep spraying the surface of the sand with a fine mist of water to stop the sand drying out too much and crumbling. Once all the triangular channels had been carved and the loose sand blown away, the sand mould was ready to accept the molten pewter. 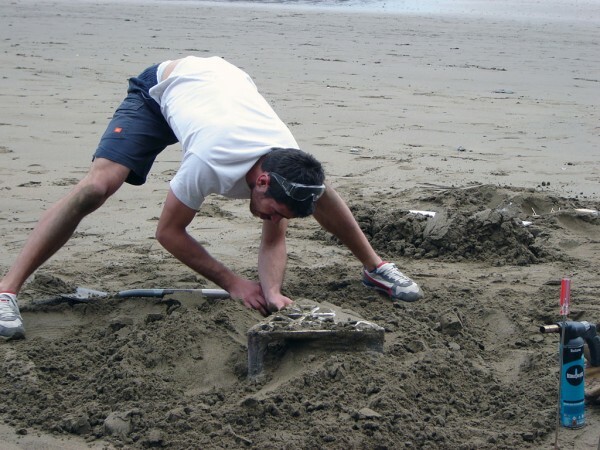 The process of carving the form of the stool into the sand took 45 minutes. I removed the lid from the first saucepan and carefully poured the pewter into the mould starting in one of the legs. Once the pewter reached just below the top of the leg I moved to the second leg and poured the pewter up to the same level. I repeated this for the third leg, then picked up the second saucepan and began pouring the slightly hotter pewter on top of the pewter in the first leg. The molten pewter began flowing along the channels and as the level of the pewter raised all the triangles connected. I poured until the pewter reached just below the level of the sand, causing a molten meniscus to form on the surface of the pewter. After 10 minutes of waiting for the pewter to cool I began to excavate. 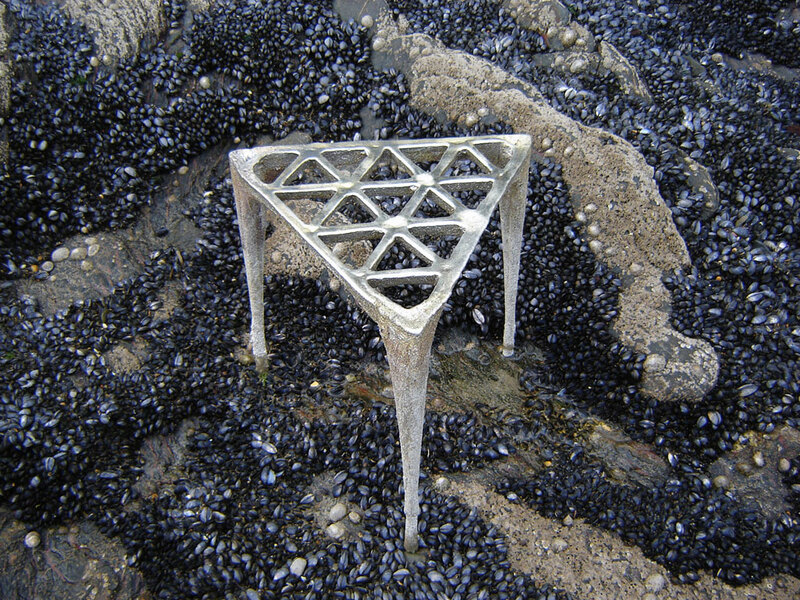 I dug with my hands pulling the sand away from the triangular seat surface and the three legs until the sand held no resistance, and then lifted the shiny pewter stool out of its mould. 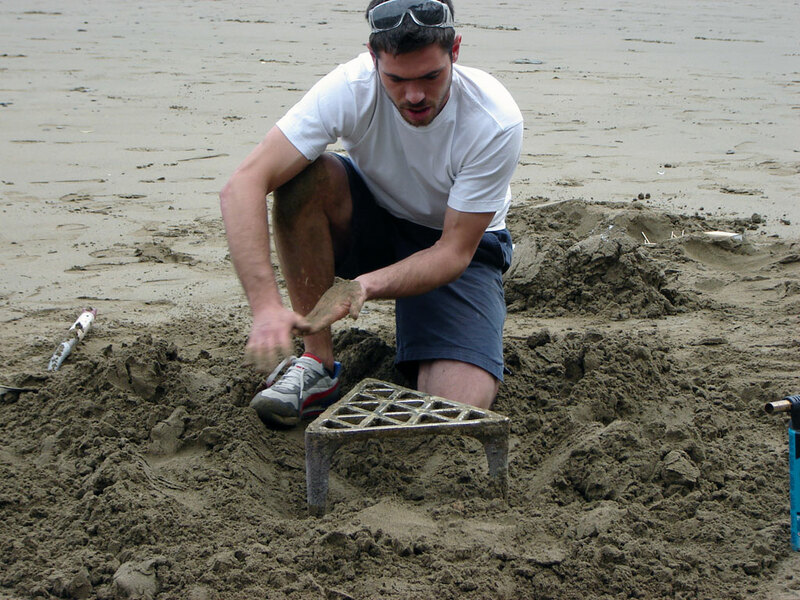 I had successfully sand cast a pewter stool on the beach.